I was completely awestruck by this book. 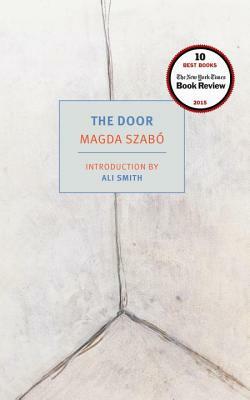 Szabó's writing is masterful, and the way she builds and bends the development of her two main characters and their relationship is completely fascinating. Truly dark without relying on being gruesome, this book is like its own doorway into a world full of suspicion, derision, and manners--by no means a happy book, but one which will wrap you up in its spell right from the first page. The Door is an unsettling exploration of the relationship between two very different women. Magda is a writer, educated, married to an academic, public-spirited, with an on-again-off-again relationship to Hungary’s Communist authorities. Emerence is a peasant, illiterate, impassive, abrupt, seemingly ageless. She lives alone in a house that no one else may enter, not even her closest relatives. She is Magda’s housekeeper and she has taken control over Magda’s household, becoming indispensable to her. And Emerence, in her way, has come to depend on Magda. They share a kind of love—at least until Magda’s long-sought success as a writer leads to a devastating revelation. Len Rix’s prizewinning translation of The Door at last makes it possible for American readers to appreciate the masterwork of a major modern European writer. Ali Smith was born in Inverness, Scotland, in 1962 and lives in Cambridge. Her latest novel is How to Be Both.